I am a fan of the Baby-Book --- in theory. But it is so hard to actually stick to it, and follow through with all of its countless demands for time and literary journalism... I'm not saying that I don't have what to write about, I am constantly repeating tales of Freida's bravery/humor/fascination etc. to friends and family who all respond with a desperate "you must write that down! ", but when it comes down to it... Baby-Books just don't seem that practical. 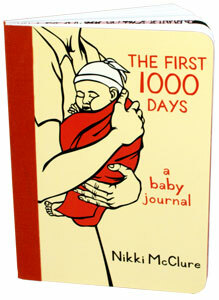 Nikki McClure has toped them all - coming in at my #1 favorite baby journal! I always loved her quaint illustrations and tranquil artisitc outlook, but this one just takes the Baby-Book concept to the next level. It's not a keepsake for newborn hospital bands, fist pacifiers, and shrouds of worn blankies - its a chance to create an epic literary masterpiece of your child's first glorious days!